Hi, I have made some hand made jewellery (bracelets, ear rings) inspired by one of my favourite anime shows and I would like to sell them (a lot of people are asking me where they can buy it). I want to check whether I will infringe any copyright and if so, how I can track down and approach the copyright holder. Basically I'm not using images of any characters, but the colours and themes from the anime. An abstract example would be a Pikachu yellow bracelet with Pikachu brown stripes which wouldn't look like Pikachu but would be recognisable by a fan of the show. A photo of my item has been shared on social media and has become rather popular hence my enquiry. I think the copyright holder might be BANDAl (Japanese company?) but I'm not sure. Do let me know whether any further information is required. Pikachu is a PokÃ©mon character, and therefore the company which owns the intellectual property rights is Nintendo/Creatures Inc/Game Freak Inc. The actual company which handles franchising and marketing is the PokÃ©mon Company. The two forms of IP involved here are copyright in the artistic representation of the character, and several registered trade marks, such as this one, for Pikachu. 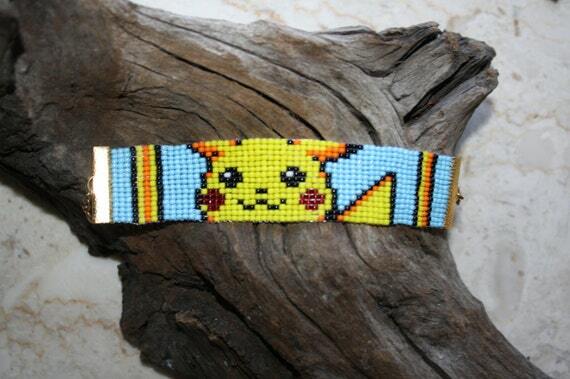 However, assuming that your bracelets etc don't actually feature a Pikachu character (as can be seen on some which appear in a Google image search for 'Pikachu bracelet'), and just use the colours in a pattern which suggests Pikachu, then I don't think you need worry about the copyright aspect. And as you plan to just use some of the typical colours associated with Pikachu, again I don't think this would infringe any trade mark. then it certainly appears as if this sort of merchandise is tolerated. Unfortunately we're not in a position to review requests to use the PokÃ©mon intellectual property (including its characters, names, and designs). As a result, we have to ask that you not use it in or associate it with your project in any way. and so it is hard to form a clear idea of what actual response you might expect from the PokÃ©mon Company if it becomes aware of your jewellery items. If you go ahead and market your products without a licence, then make sure you state prominently on your advertising material that these are not authorised PokÃ©mon products. This should work in your favour if you are unfortunate enough to face a claim of trade mark infringement and/or passing off. Thank you so much AndyJ. To be more specific, I have made some Sailor Moon ear rings which don't depict characters but have similar colours to the characters and borrow elements from the accessories the characters carry (for example a locket). In this case I believe the copyright holder might be BANDAl, not sure where to look that up. Is there a difference between hand made ready to order items versus premade items sold at markets? I'm excited about my items. tubeguy wrote: Is there a difference between hand made ready to order items versus premade items sold at markets? There isn't a fundamental difference between a potentially infringing item being mass produced, or a hand-made one-off. There is, after all, the famous case where Disney objected to their characters being painted on the walls of three Florida daycare centres, which was obviously at the "one-off" end of the scale.